Snap On Smile | Smile Angels of Beverly Hills - Bruce Vafa DDS. Chips, gaps, worn enamel and stains can all detract from the natural beauty of your smile. Cosmetic treatments are available that can transform virtually every aspect of your smile, but you may not be ready for a permanent solution. Snap On Smile offers an alternative. 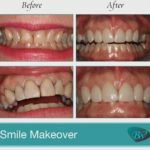 Our expert in Snap On Smile in Beverly Hills, in the heart of Los Angeles, can change the size, shape and color of your teeth and even fill in the gaps left behind by missing teeth with this simple solution. Snap On Smile is a revolutionary cosmetic treatment that makes no permanent changes to your teeth, so it can be reversed at any time. It can be made just half a millimeter thick for a comfortable yet strong restoration, and you can choose from 23 different shades and 18 different looks for a completely flattering new smile. Our Beverly Hills Snap On Smile expert will work closely with you to find the Snap On Smile solution that best meets your needs. It is especially beneficial for patients who are dental phobic, who have budget concerns or who have medical issues that affect their candidacy for other procedures. At your initial appointment, our expert in Snap On Smile in Beverly Hills, in the heart of Los Angeles, will examine your teeth and take dental impressions. Once your impressions have been taken and your dental molds created, we will design your new smile with you. When your treatment plan and molds are sent to the dental lab, they will fabricate your new smile in about one to two weeks. It will then be ready to wear. A final fitting will ensure the best possible look and feel. Our Beverly Hills Snap On Smile expert will make any necessary adjustments to ensure a perfect finish, and you will be ready to wear your new smile home. Your Snap On Smile can be worn at all times and removed only for dental hygiene purposes, or you can save it for those special occasions when you want to take your smile from ordinary to extraordinary. Snap On Smile can last years when well-maintained, and it can give you the smile of your dreams for a fraction of the cost of certain other cosmetic procedures. Contact our office today to learn more about Snap On Smile or to schedule your appointment with our Beverly Hills cosmetic dentist.